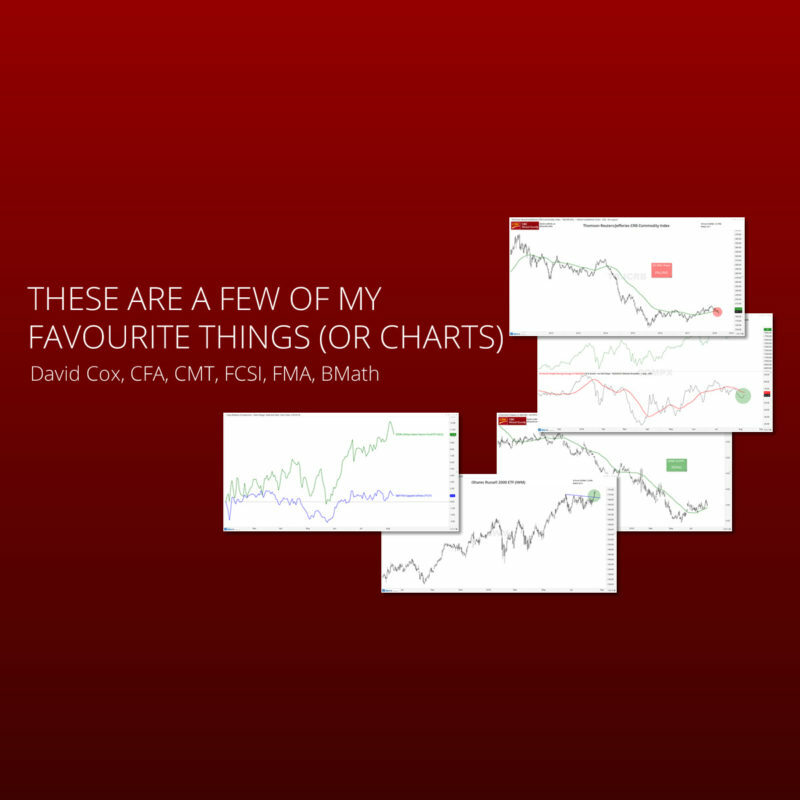 As an avid chart watcher I thought I’d share some charts with you to add some flavour to all that goes on in the world of investing. Your feedback is always welcome, so please leave a comment below! 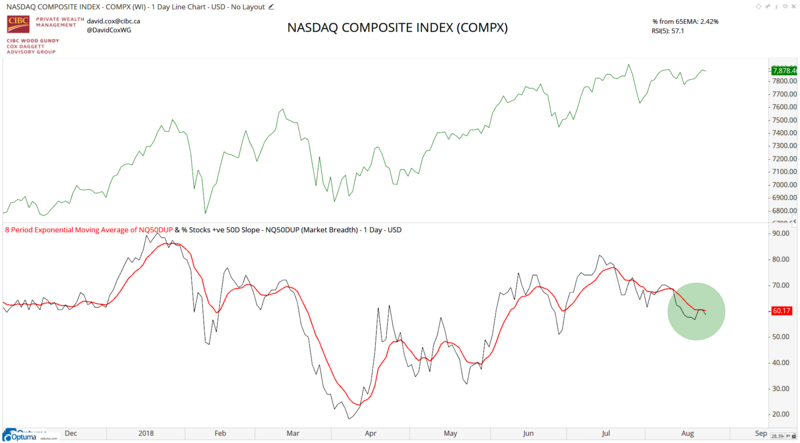 The Nasdaq Composite Index ($COMPX) has been strong. That might be an understatement. That said, this summer, it has slipped a little relatively, as small-caps and some of the defensive and more diverse segments of the U.S. market rally. What do we have below? The Nasdaq is in green and you can see that it last made highs in July. In the lower panel, we have the percentage of those Nasdaq stocks that have a rising 50-day moving average (calculated in Optuma’s Market Breadth module with the formula MA(BARS=50, CALC=Close) IsUp). We’d like to see this break back upwards (green circle), which would mean more of the stocks are rallying, which in turn would (and likely will) lead to new highs here in the near-term. Lesson: Market breadth is so crucial to track, follow and understand. It gives clues to investors. Not that we need to beat a dead horse again and bring up commodities, but really, how can I not bring them up! With so much economic growth firing out of the U.S., it sure would be nice to see commodity prices moving higher. 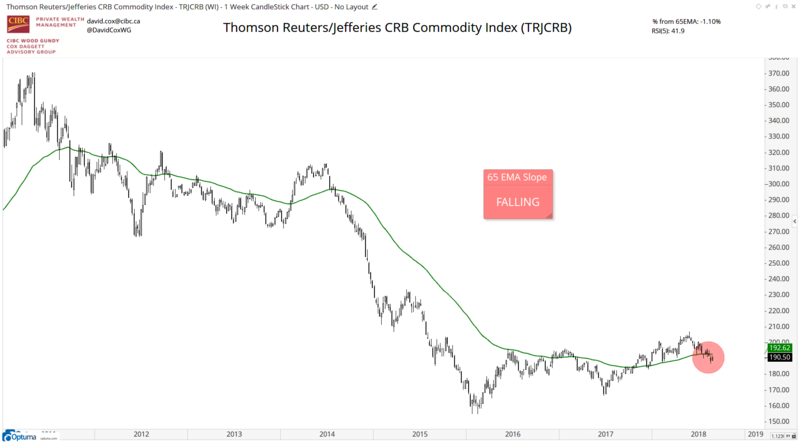 But the reality is, the Commodity Research Bureau (CRB) index is now trading below the falling 65-week moving average, which I call bearish. I don’t try to read more into than that. Lesson: You can’t make short-term decisions in the investment markets without having a bigger-picture thesis. This is the big picture. It’s surprising how many headlines and articles that I have stumbled across talking about this U.S. stock market rising on the strength of a few stocks. I just don’t get it, and frankly, I don’t see it. 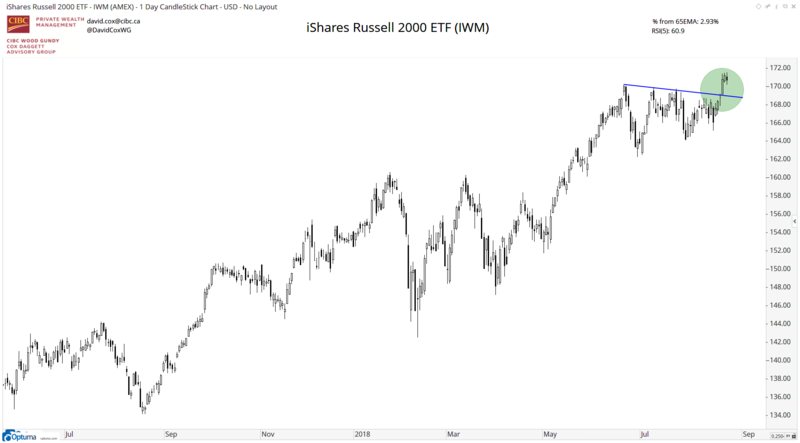 The Russell 2000 index just made new all-time highs yesterday and this is an index of 2,000 companies, most of them smaller. This is not bearish. Lesson: When small-caps are performing well, the market is taking on risk. Small-caps are performing well, so clearly, the market is still keen on taking risks. Ignore the headlines to the contrary please. Exhibit D: Consumer Staples Resurgence? 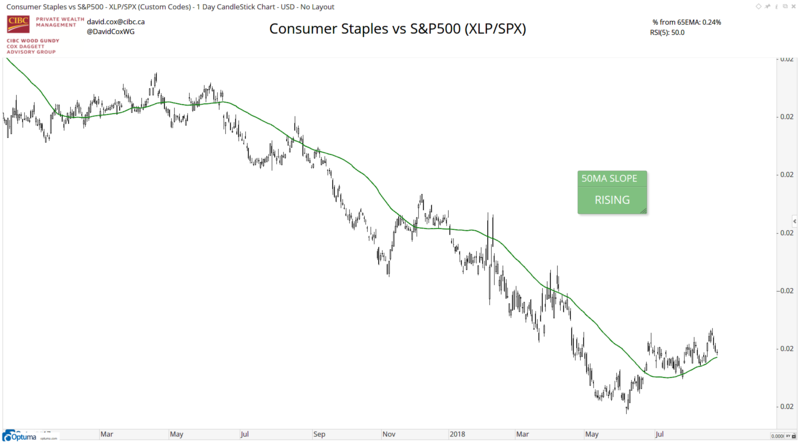 The consumer staples were crushed, both absolutely and relatively in early 2018 and have staged some relative bounce this summer. 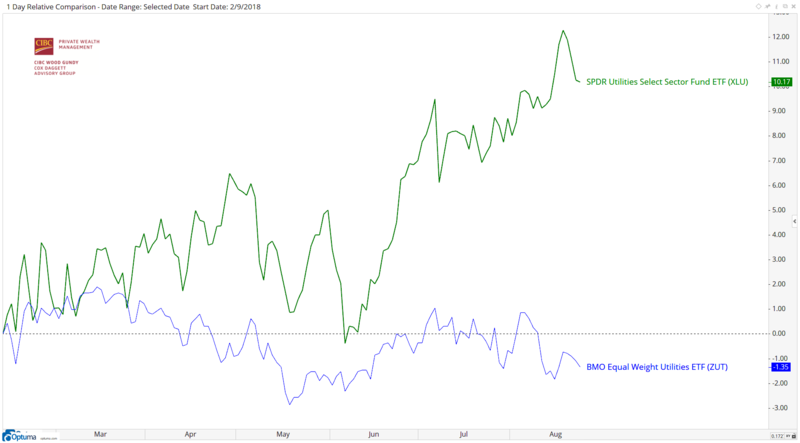 This a custom symbol showing the relative line of the SPDR Consumer Staples Sector ETF ($XLP) vs. the S&P 500 index, and the rising green line is the 50-day moving average. That said, it’s only just turned up and frankly I don’t see this as something that is anything other than some temporary action as we sift through the summer and the market tries to digest tariff and Trump risk. Lesson: Always know if the sector you’re buying or selling is a strong or weak one. Relative strength is a very important tool in analyzing stock markets. In follow up to Exhibit D, above, the utilities have had a move higher as interest rates have settled down to the lower end of their higher range. That has caused a move higher in utility stocks, but surprisingly, only on the U.S. side of the border. The U.S. utility stocks are shown in green ($XLP) and have rallied nicely since the February 9, 2018 market low (about +10%) while the TSX utility stocks ($ZUT.C) are -1.3%. That is quite the difference! Lesson: Utility stocks are interest rate sensitive and further increases in interest rates tend to cause prices to depreciate. I hope you enjoyed a few of my favourite things this month. If you would like to be added to my mailing list, please send me an email: david.cox@cibc.ca. Note: the views of David Cox do not necessarily reflect those of CIBC. 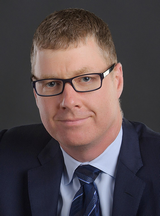 David Cox is a Portfolio Manager at CIBC Private Wealth Management in Guelph, Ontario, Canada. 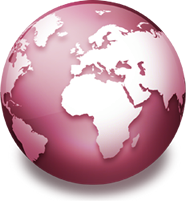 He manages assets using fundamentally screened, yet technically driven trend following and swing trading techniques. He has a Bachelor of Mathematics and is a dual holder of both the Chartered Market Technician (CMT) and Chartered Financial Analyst (CFA) designations. David has four young children and enjoys downhill skiing, classical music and is a self-professed math geek. He can be contacted at david.cox@cibc.ca.